Brake maintenance is important in helping ensure the safety of you and your passengers. There are a number of signs that indicate your brakes need attention and you want to give them the best attention there is. 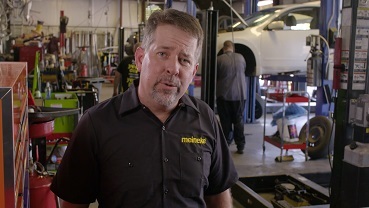 All brake repairs and brake shops are not the same and at Meineke, we know stellar service doesn’t have to exclude cost-effective solutions. If your brakes are making a squealing sound or you hear grinding when your car comes to a stop, these may be signs that you need brake service immediately. Consult a certified technician for a brake inspection any time you notice any irregularities in your car’s braking performance. There are common brake problems with common, well-known signs, such as a shaky steering wheel or a squeaky sound and we’ve all been there and know that’s an indicator for checking your brakes. However, there are many other - probably less obvious - signs your brakes may be showing which you don’t want to ignore. Many brake pads today have a built-in metal component that creates a slight squeal. The squeal increases in volume over time to alert you of the need for service. If you begin to hear a loud squeal, make sure to bring your vehicle to your local Meineke for a full, 23-point inspection. One thing you can do as a vehicle owner is better understand the different moving parts that make up your brake system. When you press your brake pedal the brake pads create friction; in turn, the brake rotor disperses heat throughout the vehicle to keep the brakes themselves from overheating. Both are essential to the proper functioning of your braking system. And both need proper inspection when servicing your brakes. Why Get A Brake Assessment? Brakes are designed to wear out. The pads rub on the brake disk to stop your car, so worn pads are the first part to check if you are experiencing any braking problems. A full inspection though will show underlying problems, as well as what can be repaired and what needs replaced. Brake pad replacement is the most common repair job for automotive brake systems. Brakes keep you and your family safe. Brake parts and brake services are not what you want to skimp on. But we understand the importance of reducing expenses and we aim to offer cost-effective solutions that provide leading services as well. Q : How should brakes work? Brakes are designed to counteract your vehicle’s movement. When you press down on your brake, a lever acts on the master cylinder to release hydraulic fluid. This fluid triggers a chain reaction in the hydraulic system moving from cylinder to cylinder to multiple the small force applied by your foot to bring your car to a stop. Q : What are brake pads? Brake pads work with the brake caliper to stop the spinning motion of your wheels. The caliper squeezes the pads together, creating friction between the pads and the brake rotors. The pads and rotors then work together to stop your car’s wheels. When you apply pressure to your brakes and hear a squeak, it’s most likely your brake pads warning you they may need to be replaced. Q : What’s a rotor? Brake rotors, also called brake discs, are a key part of your car’s braking system, As the brake pads clamp down on them, the applied pressure will stop the spinning of your wheels. Q : How long do brake pads and rotors last? Brake pads typically last between 30,000 and 70,000 miles. Brake rotors can last up to 3 times longer than the pads, but it depends greatly on driving habits and environment. Q : How should brake pedals feel? When you apply your brakes, they should feel firm throughout the process, and the harder you push, the firmer your brakes should feel. If your brakes feel spongy when pressure is applied, then you should have them evaluated by a professional mechanic. Spongy brakes could be a sign of a problem in the hydraulic system, such as failing calipers or a weak flex line. Q : My brake pedal feels spongy. Why? The brake pedal feels spongy when brake fluid is not flowing properly. This means that air got into the lines, preventing the fluid’s proper flow. To get rid of the air, you’ll need to go through a process called “bleeding the brakes”. Q : What is a brake system flush? A brake system flush is when existing brake fluid is removed and new fluid is added to the hydraulic system. This ensures proper performance and increased life span of your brakes. Q : Do I have to change my brake fluid? Yes. Brake fluid affects the operation of your braking system, as the presence of water in the brake lines reduces the fluid’s boiling point, therefore the vehicle’s stopping ability is diminished in hard stops. Q : How often do you need to change brake fluid? 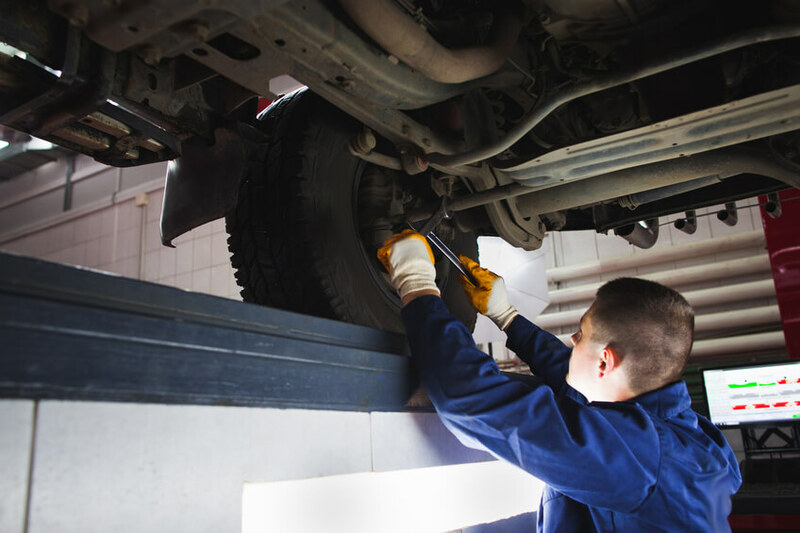 This is dependent on the make and model of your vehicle; refer to your manufacturer’s scheduled maintenance guide for best practices for your vehicle. A general rule of thumb is replacing brake fluid whenever your brake pads are replaced. Q : What causes brake noise? There are several reasons for hearing noises when braking. Squealing noises can be caused by rusted rotors, while squeaking noises usually indicate cheap brake pads or the indicator hitting the rotor. Grinding noise is caused by the contact of the rotor disc with part of the caliper. Q : I hear a grinding noise when I step on the brakes. Should I be concerned? Yes. This is a wake-up call to stop driving the car and have it checked out. 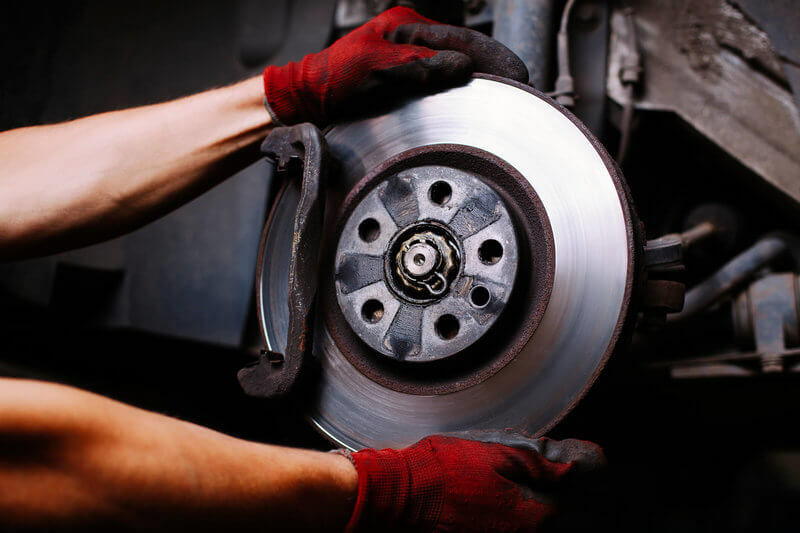 The grinding noise usually indicates the lack of brake pad material, which means the pads are so worn out that the rotors and brake pads are now metal on metal. Q : The car pulls to the right or left when I step on the brakes. Why? The usual cause of the car pulling to the left or right when braking is contamination of the braking system. It can also happen if a caliper malfunctions. Q : My car shakes when I hit the brakes. What’s going on? The most common answer is that brake rotors are out of bound, in which case you’d also be able to feel it through the brake pedal. The vibration can also occur when a brake caliper sticks on, in which case the steering wheel will vibrate as well.